Assigning Descriptive Names to Malware – Why and How? In addition to naming malware according to predictable formats, as I described earlier, security firms often assign descriptive names to high-profile malicious programs. The researcher who coins the name that sticks, should the specimen gain notoriety, gets bragging rights. The person’s employer might also benefit from a slight marketing boost. It’s natural for a researcher analyzing a malicious program to want to refer to the specimen by a memorable name. Such descriptive names might be based on a file name that the program used, a registry key it created or a relatively unique string embedded in the executable. Because the origins the Duqu discovery trace back to CrySyS, rather than stemming from independent discoveries made by antivirus companies, the security community didn’t have the opportunity to develop alternative names for this malware. As the result, Duqu is the name that stuck. 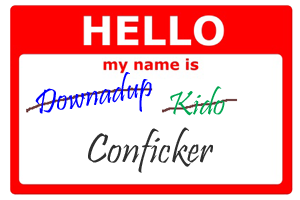 The name Conficker stuck, perhaps because it was more memorable than the alternatives. Sean Sullivan from F-Secure pointed out that the company initially “used Downadup (Kaspersky based name), but kept getting asked about Conficker.” So they switched. I’m fascinated by onomastics, and wish I had the time to perform a more comprehensive study of the descriptive names that have been assigned to popular malware samples in the short history of the antivirus industry. Digging into the details, including interviews with the people who examined the specimens and picked the names could provide an interesting context to such stories. Perhaps someone else can take on that quest.